Subscribe to my ebook newsletter! So, I’ve finally did the thing that all ebook authors have suggested that I do: I started an email newsletter. Check out the Star Runner Dispatches for the latest news on Robot Awareness and whatever other hi-jinks I’ve been up to! One thing you will definitely get from this newsletter: Deals. Subscribers will get first dibs on the latest deals. When I decide to offer a book for free, you will be the first to get it. Oh you can rest assured, there will be deals, special offers, and freebies for you as a subscriber. So I didn’t want to simply add people I know without their consent (a good way to get people to instantly unsubscribe). So I’ll leave it to all of you to subscribe. If you want. No pressure. I don’t have a tweed polyester suit or anything. Though sometimes this indie publisher thing forces me to go into used car salesman mode a tad. Where did the name come from? Thanks for asking! The Star Runner is a newspaper (or at least, the incarnation of what newspapers have become in the world of Robot Awareness) that will play heavily in later chapters of Robot Awareness. So, without further ado, Subscribe to the Star Runner Dispatches. You know, if you want to. 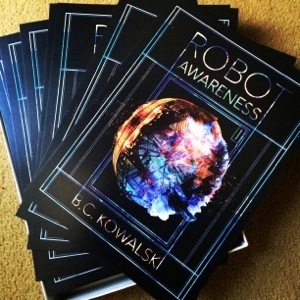 Oh, and if you haven’t already, maybe check out Robot Awareness: Part I, on Kindle or Kobo?